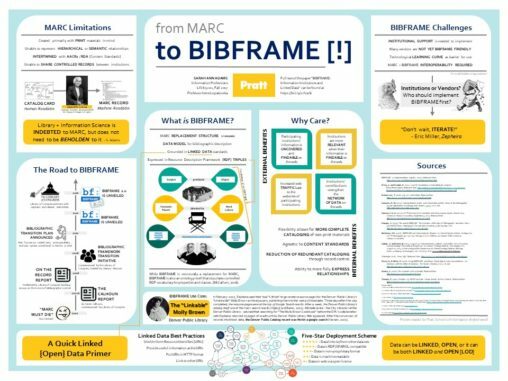 This poster seeks to overview, briefly, MARC’s limitations, the history of the transition away from MARC toward BIBFRAME, the functionality of BIBFRAME, and the opportunities and challenges presented by BIBFRAME. Our research briefly examines the evolution of hashtags from an online organizational tool to a cultural phenomenon that serves a rhetorical function as a paralinguistic communication method. We include an analysis of the role of hashtags as image annotation metadata and as a framework for digital library taxonomies. 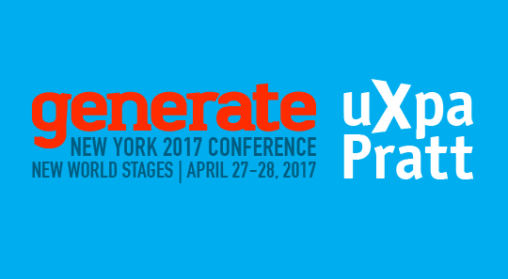 The seven participants of this panel, in addition to myself, attended this year’s Generate New York conference as a group. This trip was put together by UXPA@Pratt and was paid for by the GSEF Committee. We’ll be discussing some key takeaways and common themes from this year’s conference. A full user-centered re-design of the Voorheesville Public Library website, starting from user research and persona development through card sorting and tree testing the information architecture and finishing at a responsive digital prototype. The Institute of Jazz Studies at Rutgers University is “the world’s foremost jazz archive and research facility.” To help the IJS make its one-of-a-kind collection even more accessible, our group completed a user-centered redesign of the IJS site. This design story documents the process of redesigning the Bronx County Historical (BCHS) website. BCHS presents a wide range of historical materials, is active in fundraising, and hosts monthly public events. It places a great deal of importance on its website in promoting its mission and sharing its resources, but does so in a crowded digital environment. New York City is home to many historical and cultural organizations that are in competition with BCHS for attention and fundraising dollars. A story of how We’re From Geocities, a design team from Pratt Institute, used information architecture and interaction design best practices to re-design the website of National Film Preservation Board. The Desk Set, a design team made up of library and information specialists, applied information architecture and interaction design best practices to a website re-design of The Grolier Club. What is in a name? Why do we need naming conventions in the first place? A naming convention is one of those things that people take for granted…. Warp and Weft is a linked data website collecting textiles from the Met and Cooper-Hewitt. We will cover the stages of a LOD-LAM project, from the underlying data model, to converting records into RDF triples, and building the Drupal website.